Calling all American Girl fans. I’m excited to see that American Girl has released several new titles. New additions to their book collection include: 3 new mysteries, 2 new “Innerstar University” books, and a book titled, A Smart Girl’s Guide to Liking Herself – Even on Bad Days. These books are for ages 8+ but Kenzie who is now 6 started really enjoying the American Girl stories and movies by age 5. Now at 6 1/2 she’s totally into me reading them aloud and is beginning to be able to read them to herself. The Mystery collection is a great way to get to know each historical character in greater depth and engage with them again too! Kenzie had a blast reading the Innerstar University sample book we received as this is an interactive book where the reader makes choices throughout the story -with decisions resulting in 20 different stories! Kenzie thought this book was so cool and I loved that it began to introduce to her the choices one must make when navigating relationships and friendship – something she’ll continue to do more and more of on her own as she slowly leaves this Mama’s protective nest at school and at all her exciting new activities from swim team to spanish class to playdates with friends. Until April 1st, American Girl is having Free shipping on all orders over $50 – my email offer from American Girl said to use code “173852” at check out. 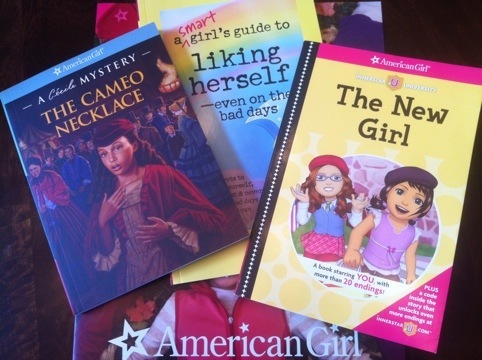 Disclosure: Thanks to American Girl for sending us samples of their 3 latest titles. We’re American Girl fans and love sharing their news, testing their products, and buying them too. As always, all thoughts and opinions are my own.